There have been mixed reactions in Cameroon after the Confederation of African Football (CAF) withdrew the 2019 continental soccer event-hosting rights from the central African state. The government has described the CAF decision as "total injustice" while some people say the suspension should act as an eye opener for the government to solve the crisis that has destabilized the English speaking regions for more than two years. Night shift workers transport roofing material and seats to the Olembe stadium on the outskirts of Cameroon's capital, Yaounde. It is here the government of Cameroon had announced the opening and closing matches of the 2019 Africa Cup of Nations would take place. Olembe stadium on the outskirts of Cameroon's capital, Yaounde, Dec. 1, 2018. Work supervisor Angel Thamin says they are working night and day so that the stadium should be ready by March 2019, three months before the official kickoff of the competition. 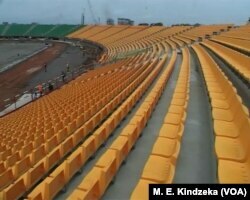 "For the main stadium, all the structure elements are here, almost a hundred percent," he said. "When it comes to office ventilation as you can see, I mean, you know it is extremely advanced and the main stadium will be finished in terms of structures and as you can see now, it is not only foundations and columns, but you can see slabs that are ready." 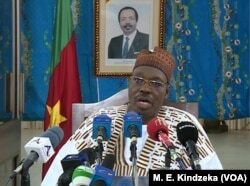 Issa Tchiroma, Cameroon government spokesperson and minister of communication says the government has instructed all companies working on infrastructure projects for the football feast to continue as if CAF had not stripped hosting rights from Cameroon. Cameroon communication minister and government spokes person Issa Tchiroma says the decision to withdraw hosting right is total injustice. "Cameroon has put in a creditable performance," said Tchiroma. "It shall prove it to the entire world by completing with the same determination and on time, the construction of this modern infrastructure belonging to the Cameroonian people. Our country which has written the pages of African football in bold letters will not relent her effort in working with other African countries to develop football in our beloved Africa." Issa Tchiroma says Cameroon, a five-time African football champion, agreed to host the prestigious African event even though CAF decided to increase the size of the tournament from 16 to 24 teams without asking its opinion. But during Friday's extraordinary meeting of CAF's executive committee in Accra, Ghana, the football body said the infrastructure was not ready. They also raised security concerns, especially in the restive English-speaking regions where armed conflicts have continued for more than two years, leading to the deaths of more than 1,200 civilians, fighters and military personnel, and leaving hundreds of thousands displaced. Bepanda Stadium in Douala, Dec. 1, 2018. Gladys Matute, a 24-year English-speaking Cameroonian says she is very okay with the decision to remove hosting rights from Cameroon until peace is negotiated in the restive regions. "We cannot be hosting an event when we know that the two English speaking regions are not at peace," she said. "They are killing people, so it is good for the president to come back and sit and talk with the Anglophone regions so that there should be some peace. Paul Biya should sit up and there should be some peace talks." Secondary school student Rose Ghani says she had expected CAF to withdraw the hosting rights a long time ago. "We are not surprised because embassies have been refusing their citizens from traveling to Cameroon especially to the northwest and southwest," she said. "And also we have the Boko Haram fight in the far north. Moreover, all the towns to host are suffering from insecurity. There is also fear that when the tournament will be going on the Ambazonian fighters might attack people in Yaounde." The 2019 finals will take place from June 15-July 13, a change from the traditional January period. Cameroon had proposed five cities, Limbe, Bafoussam, Douala, Garoua and the capital Yaounde as competition venues. CAF says it has initiated an urgent and open call for a new host.